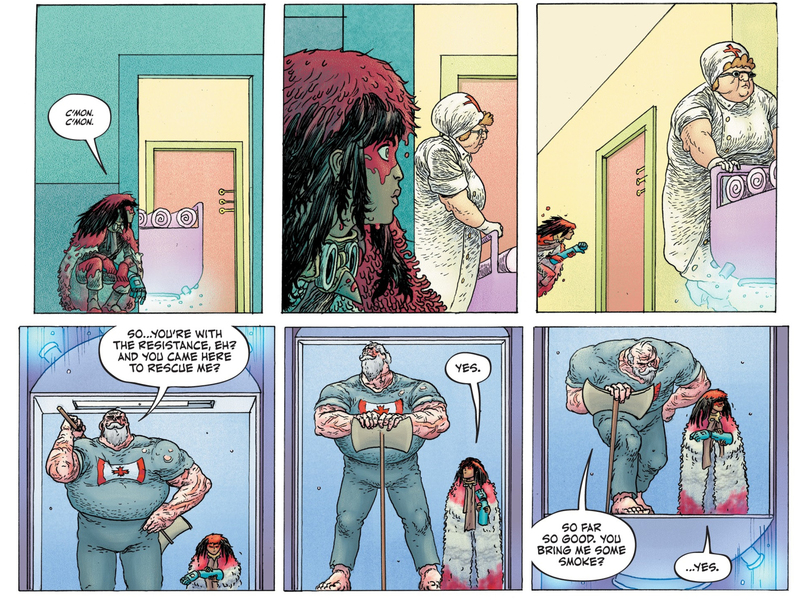 There are a lot of cool things about this comic, but one thing really stuck out to me: Bertram’s layouts. 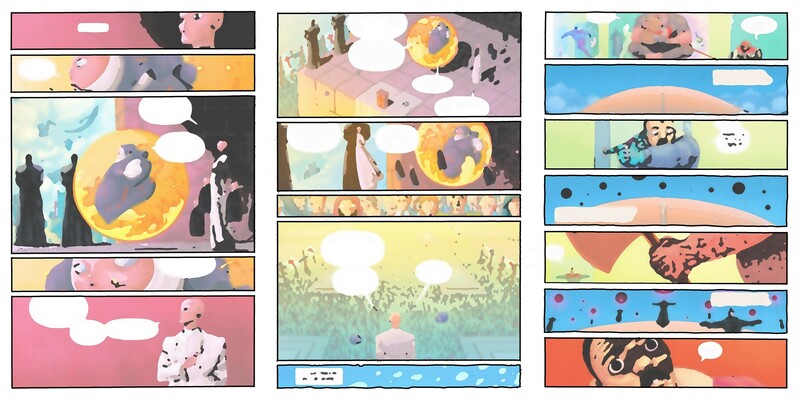 Most of the comic is built on stacked page-width panels, creating a very specific rhythm. A cool recurring feature of this layout is the narrow sliver panel. 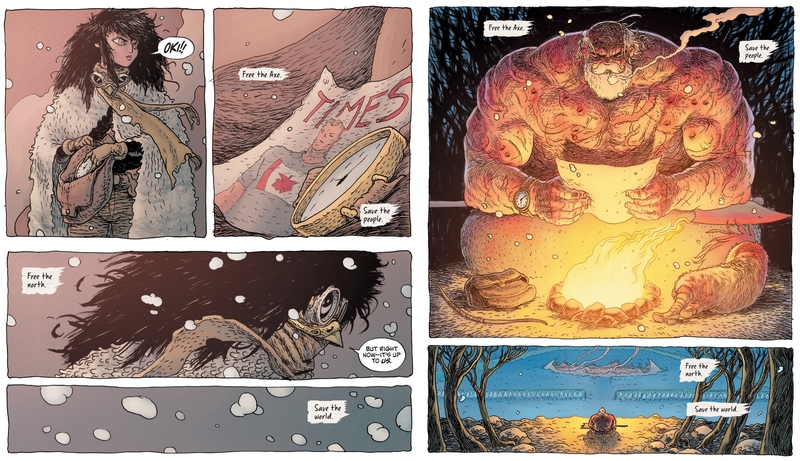 The comic finds multiple uses for them: establishing shots and scene transitions, extreme close-ups that create claustrophobia or – the opposite – imply an image that stretches way past the panel’s boundaries. 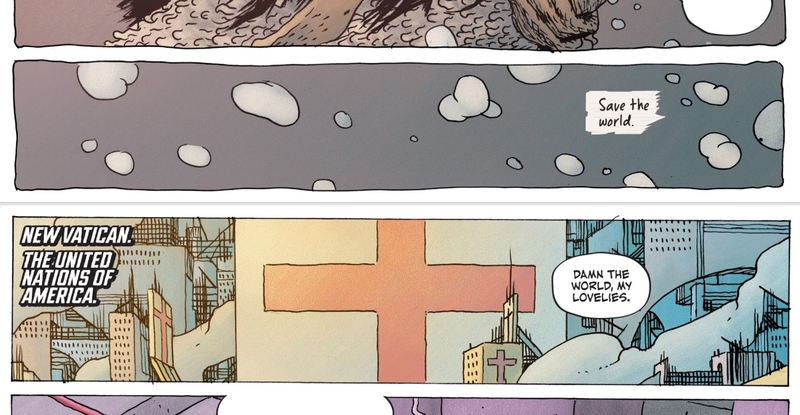 When that rhythm is broken, with multiple panels on a row, it feels meaningful. 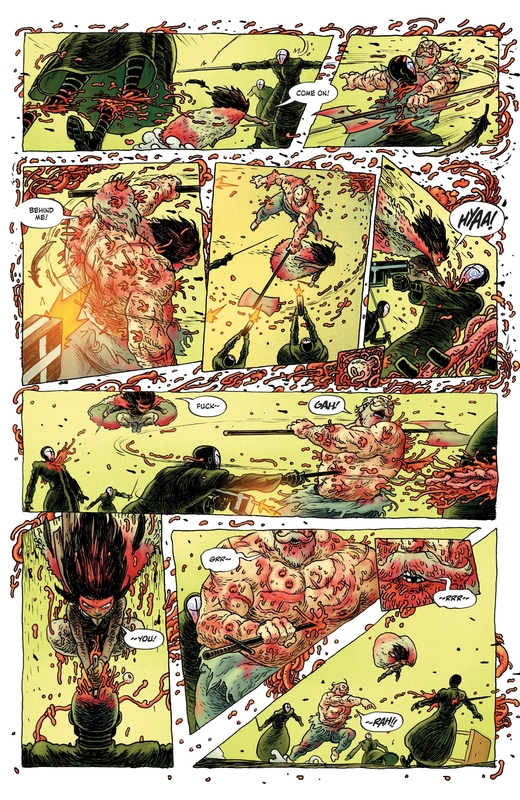 Note how it creates a more regular, second-to-second beat – pow, pow, pow – rather than the stretched-out moment of a single page-width panel. And once the violence kicks in, it shatters the layout entirely. Panels slope, overlap onto one another, stuff slips into the gutters… It’s well-communicated chaos. 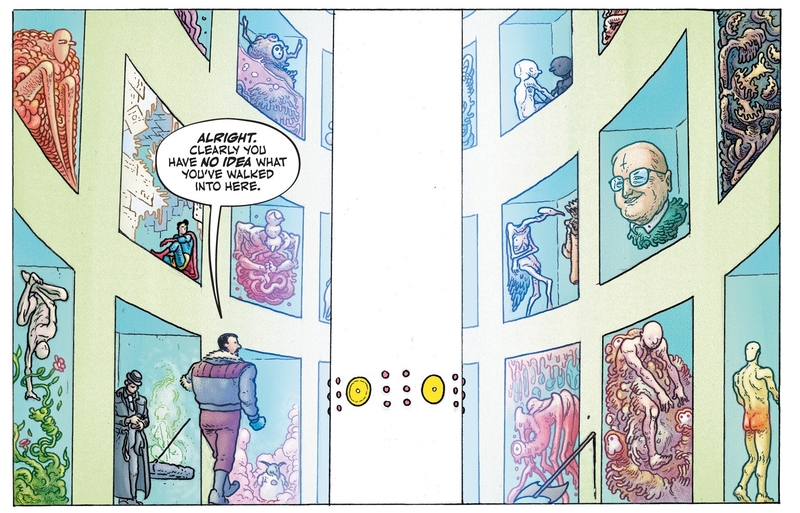 Also, maybe it’s because I was paying such close attention to the layout, but when we arrive at the prison (where at least one superhero is being held), the windows of the cells couldn’t help but remind me of panels on a comics page. Note how Bertram defaults to wobbly edges on his panels, but switches to straight ruled borders whenever we move inside the walls of New Vatican. It’s a great way of reinforcing the contrast on this page turn. Some great lettering here from Aditya Bidikar – speech bubbles that are equal parts scriptural and robotic, perfectly capturing the creepy little dudes they belong to. Look at the claustrophobic composition of this panel – the sheer amount of negative space emphasises how tight the drawn area is. 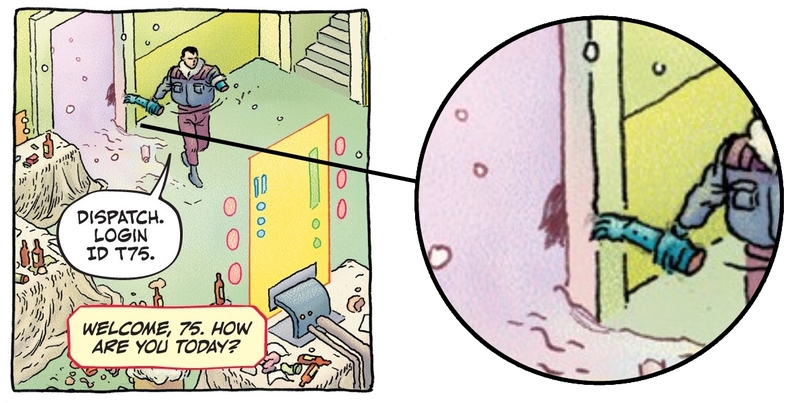 A cool little detail that I think speaks to an expectation that people will read this comic multiple times: when Little Bird infiltrates the base, she’s just barely visible, hidden behind walls and doorframes. You’d only spot her if you already knew what you were looking for. 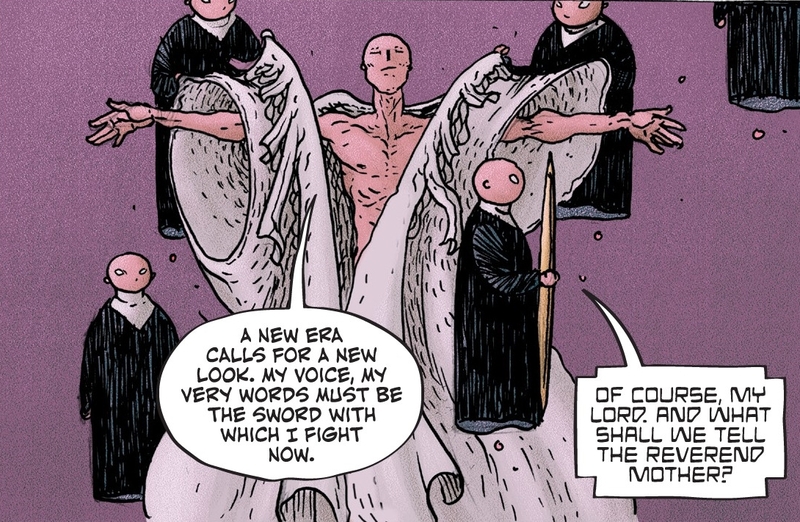 A cool trick that’s used across all three issues I’ve read previews of: the opening narration is echoed at the end, perhaps with a little twist in the words to change the emphasis. 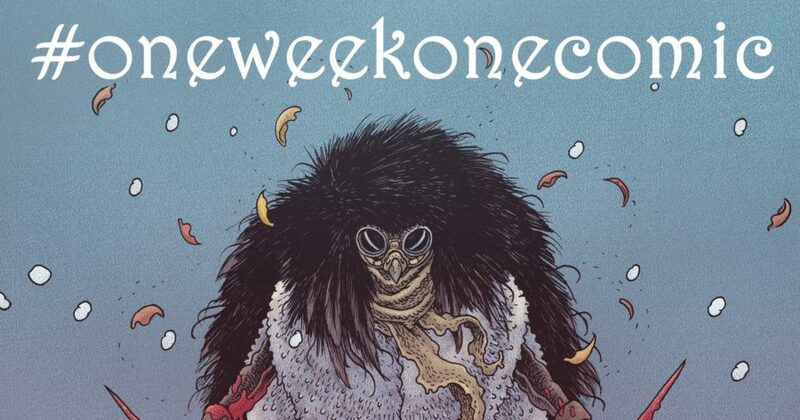 Again, feels like something intended to enrich second and third readthroughs. 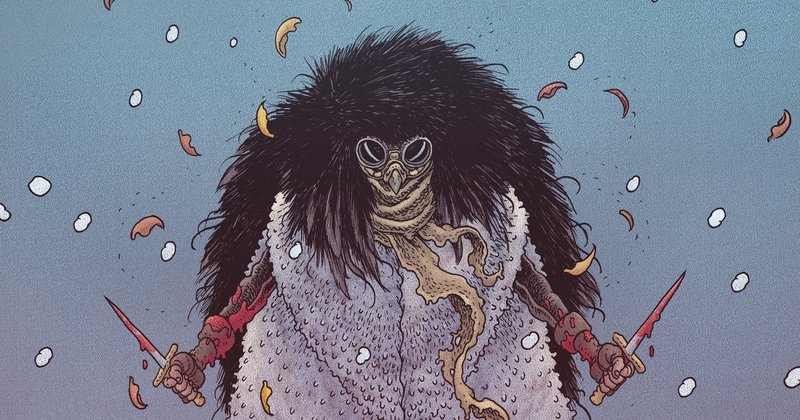 Little Bird #1 is a really interesting comic, and apparently there’s currently no plan to collect these (double-sized) issues in a trade – so you might want to pick this up before it flies off shelves.